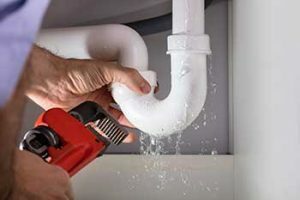 Water leaking beneath your sink may be coming from a cracked disposal, or one that is deteriorated at connecting parts. Your garbage disposal is an essential part of keeping your kitchen sanitary and odor-free throughout the year. However, there are a few critical signs to look out for that may indicate that your disposal is failing to work as it should for your sink. If you suspect that you may need to replace your garbage disposal in the near future, consider these five signs that now may be the time. If you notice foul odors lingering around your sink lately, it may be a sign that your garbage disposal needs to be replaced. These odors are often caused by wet food deteriorating in your sink that is trapped in your garbage disposal. Once you have confirmed that the source of these nasty odors is your sink, you may need to call your plumber for professional assistance. Your garbage disposal should easily break down food left in your sink. However, water that quickly rises to the top of your sink as your faucet is running may be indicative of a clog caused by your garbage disposal. In addition to foul odors, frequent clogs in your sink drain are also signs that your garbage disposal may need to be replaced in the future. Water leaking beneath your sink may be coming from a cracked disposal, or one that is deteriorated at connecting parts. Don’t let a leak go unrepaired! Call a professional at Metcalf right away if you are noticing water accumulating under your sink. Any noises coming from your sink that are out of the ordinary may also be signs that your garbage disposal should be replaced. If you hear the sounds of metal crushing or scraping coming from your drain, do not continue to use your garbage disposal until it is inspected by a professional. If your garbage disposal suddenly shuts off as you are using it, your disposal may have issues with its motor or power connection. Do not attempt to fix this issue on your own! Call a plumbing professional as soon as possible. Metcalf Plumbing is a customer-focused plumbing contractor serving residential and commercial clients throughout the Catonsville, Ellicott City and surrounding areas. From water heater installation, sump pump installation and repair to water and sewer line replacement, Metcalf Plumbing is a trusted resource to call on when you need help with your plumbing services. We are not commission-based and we provide honest, upfront costs with a thorough inspection of your system and suggested next steps. Our trained and courteous technicians are standing by to provide quality comfort at competitive prices. You can call us at 410-242-311 and don’t forget to follow us on Facebook, Google+, and Twitter! This entry was posted on Friday, March 29th, 2019 at 3:12 pm. Both comments and pings are currently closed.